The uninitiated may be surprised by the complex variables that go into the decision of which barrel to choose. But to get the most out of your rifle, you need to consider all of them. Some of the differences in accuracy may be minor, unless you’re a competitive shooter, but in the long run each variable will matter. The difference between cold hammer and mil-spec barrels lies in the manufacturing process — or, more specifically, in how the rifling is cut into the barrel. Gun barrel rifling — the spiral grooves in the barrel — was developed by the Germans a few hundred years ago, and was inspired by how a slight twist in the fletching (the feathers) helped the accuracy of archers. That slight twist made the arrows spin after they were released from the bow. German gunsmiths applied the same concept to their barrels by cutting twisting grooves in the barrel. This twist helps stabilize the bullet in its trajectory, making the weapon more accurate at a longer distance. The Germans introduced rifling to the Continental Army during the Revolutionary War, giving us an advantage over the British because our soldiers could engage targets with greater accuracy from a longer distance. Cold hammering forged is a relatively new way to cut rifling into a gun barrel. A barrel blank is inserted into a machine and a mandrel in the shape of the rifling grooves is inserted into the blank. Hydraulic hammers pound on the barrel, shaping the inside of the barrel into the grooves. Mil-spec barrels are made the old-fashioned way, by cutting the rifling into the barrels. For most, a cutting rod with a number of blades increasing in size is pulled through a barrel blank while twisting. This is called “button rifling.” Each blade cuts deeper until the final one gets to the necessary depth needed for rifling the barrel. Some manufacturers use a rod with a single blade to cut to the depth of the rifling in one motion. It takes longer to make the cut, but some firers stand by it. Cold hammer forged AR-15 barrels are relatively inexpensive to manufacture, but the initial investment in the machinery is rather substantial. Only larger manufacturers who can finance that machinery use this process. This process does, however, create a high-quality and incredibly durable barrel. It may affect your bottom line, though. Those expensive machines must be paid for with the added cost passed on to the consumer, so a cold-forged AR-15 barrel may cost an additional $75 or more. If you’re a competitive shooter, this may be well worth the investment. Otherwise, an AR-15 used for home defense or varmint control on your property will meet your needs perfectly with a mil-spec barrel. There are two basic options to choose from for your custom AR-15 barrel: chrome or stainless steel lining. As with most aspects of customizing your AR, the decision will come down to how you plan to use your rifle. Chrome lining helps your barrel last longer and it makes for easier cleaning and maintenance. The military uses chrome-lined AR-15 barrels for the M16/M4 because it helps prevent corrosion in the harsher environments that combat soldiers may experience. However, because the chrome is applied after the rifling is completed, it’s not really evenly applied. This can affect accuracy at longer distances, if only minimally. A chrome-lined barrel will be accurate to 300 yards or more — army shooters qualify on 300-meter ranges — and if you fire a great number of rounds, your chrome-lined AR-15 barrel will last longer. On the other hand, many competitive shooters prefer stainless steel AR-15 barrels so they can enhance their accuracy over a longer trajectory for their targets. Barrel Lengths: Which One Is Right for You? At Wing Tactical, we have barrel lengths available from 7.5 inches — for an AR pistol — to 18 inches. If you want a barrel shorter than 16 inches for your rifle, you’ll have to apply for a Class III tax stamp from the ATF, which will cost you about $200. You can opt for a 14.5-inch barrel with a pinned muzzle device to give yourself a full, legal 16 inches and avoid the tax. Again, how you plan to use your AR will play a part in how long a barrel you choose. A longer barrel will allow the expanding gas behind the round to build to a greater pressure, which will increase muzzle velocity, and all the rifling will further stabilize the bullet. The longer the barrel, the more accurate you can be. If you plan to use your AR for home defense, a shorter barrel will make it easier for you to maneuver around your hallways and you’ll be able to quickly engage an intruder. An AR pistol or short-barreled rifle (SBR) may suit your needs. Just remember the ATF tax stamp. Otherwise, it’s a federal felony. If you intend to use your AR primarily for long-distance shooting (300 or more yards) or for hunting, you probably want to choose a longer barrel. This will give you a more stable round with greater muzzle velocity to hit those farther targets more consistently. If you want to use your custom AR-15 barrel for a variety of purposes, the perfect middle-ground for your barrel length is 16 inches. You can consistently hit targets at 300 yards or more and you’ll be able to maneuver around your home to defend it with ease. Twist rate refers to how fast the barrel’s rifling causes the bullet to spin as it’s fired. It’s expressed in ratios — 1:7, 1:8, 1:12, etc. A barrel with a 1:7 twist rate will spin the round once every seven inches. Generally speaking, faster twist rates — such as 1:7 or 1:8 — are better for heavier rounds and vice versa. A lighter round will “over-stabilize” at a higher twist rate. That may affect accuracy, although probably only minimally. It’s a good idea to use ammunition with the ideal range of weight grains with the following range of barrel twist rates. This will help maximize the stability of the round and the accuracy of your shot. catastrophic. However, a barrel with a .223 Wylde chamber and a barrel chambered for 5.56 ammunition can fire 5.56 or .223 ammunition. Another important factor is the barrel profile, or weight. There are three general profiles. Lightweight (also called pencil) barrels are easier to carry around. However, they don’t have the durability of others. The government, or medium-profile, barrel, which is the mil-spec option on the M4/M16, has a good balance of weight and durability. Heavy barrels are great for absorbing the heat from high-volume firing. They last longer than other barrels, and if you’re not going to be carrying it over long distances, it could be ideal. You can also purchase a barrel with fluting, or contour. These grooves in the barrel help reduce the overall weight and provide more surface area to release built-up heat energy more rapidly. Based in Cincinnati, Ohio, Faxon Firearms produces high-quality stainless steel and 4150 CMV steel AR-15 barrels. Their in-house design and production in a single facility helps them make advancements to their products and put them on the market at a rapid pace. They use high-quality steel barrel blanks. The Faxon Firearms 10.5" Gunner Profile 300 Blackout Barrel is a great option to make an AR pistol or SBR with its 1:8 twist rate. The Faxon Firearms .223 Wylde Flame Fluted Match Barrel has a 1:8 twist rate and their famous flame fluting to lower weight and enhance barrel cooling. Faxon Firearms .223 Wylde Heavy Fluted Match Barrel also has a 11-degree target crown and fluted heavy profile to ensure superior accuracy. The Faxon Firearms .223 Wylde Pencil Profile Match Barrel is match-grade quality with a button rifled 1:8 twist and lightweight pencil profile for ideal balance of weight and performance. Odin Works is run by self-defined gun enthusiasts with backgrounds in high-tech fields like the aerospace industry. Their goal is to make their customers better shooters because they have better products. All their barrels come with a low-profile gas block, and their precision button rifling stands up to the heaviest of use. The Odin Works .233 Wylde Barrel is made of stainless steel with a medium profile and 1:8 twist rate. It comes in four lengths: 7.5" pistol-length, 10.5" carbine-length, 14.5" carbine-length and 16.1" mid-length. The Odin Works 10" .223 Wylde Ultralite Barrel is a lightweight, stainless steel barrel with a 1:8 twist rate. The Odin Works 16" .223 Wylde Ultralite Barrel is another lightweight, stainless steel option with a 1:8 twist rate. The Odin Works 10" 300 AAC Blackout Barrel is stainless steel and fires a .300 caliber round. It has a 1:8 twist rate and it also comes in a 16” length. Aero Precision 5.56 AR-15 CMV Barrel has a 1:7 twist rate and QPQ corrosion resistant finish, which offers great durability for excellent performance. Aero Precision .223 Wylde Stainless Steel Barrel (Nickel Boron Coated M4 Extension) has a 1:8 twist rate with the addition of Nickel Boron coated M4 extension that prevents corrosion and ensure reliable feeding. The Aero Precision 300 Blackout CMV Barrel is made from Mil-Spec Chrome Moly Vanadium Steel and high pressure tested, this ensure the barrel can handle anything life throws at it even with heavy use. Seekins Precision is dedicated to making parts that will stand up to the rigors of heavy use, whether you’re in a competition or out in the field. The Seekins Precision 10.5" .223 Wylde Match Grade Stainless Steel Barrel is made from premium stainless steel, with a button rifled 1:8 twist. The Seekins Precision 16" 223 Wylde Match Grade Stainless Steel Barrel has precision-machined button rifling with a 1:8 twist rate. It’s non-glare bead-blasted for ease of maintenance. The Seekins Precision 8" 300 Blackout Match Grade Stainless Steel Barrel has a 1:7 twist rate and is built to withstand the rigors of tactical or competition use. The Seekins Precision 18" 223 Wylde Match Grade Stainless Steel Barrel gives you the length you want for accuracy over a longer distance, with a 1:8 twist rate. Spike's Tactical specializes in making high-quality cold-forged AR-15 barrels. They’re on a mission to produce the highest-quality products for whatever purpose you need it for — competitive shooting, hobby shooting or tactical use by law enforcement or military operators. The Spike's Tactical 11.5" Cold Hammer Forged (CHF) Lightweight 5.56 Barrel has a 1:7 twist rate and it strikes the balance between a lightweight profile and serious durability. The Spike's Tactical 14" 5.56 M4 LE Mid-Length Lightweight Barrel is a great option for your custom AR-15 barrel with a hard chrome chamber and bore, along with a 1:7 twist rate. The Spike's Tactical 14.5" 5.56 FN Cold Hammer Forged (CHF) Mid-Length Barrel has a mil-spec profile and a 1:7 twist rate. Its hard chrome lining gives you extreme durability. The Spike's Tactical 16" 5.56 FN Cold Hammer Forged (CHF) Mid-Length Barrel has the same mil-spec profile and 1:7 twist rate. Its hard chrome lining give you durability while its length gives you added accuracy over distance. The Spike's Tactical 8.1" Cold Hammer Forged (CHF) 5.56 Pistol-Length Barrel is a great option for your AR pistol or SBR. Its chrome lining will give you matchless durability. Spike's Tactical M4 16" 5.56 LE Barrel (Multi-Gas Length) has a mil spec profile with chrome lining for durability and the length for accuracy. You can also make your pick of gas tube with a mid-length or carbine-length option. The Spikes Tactical 8" 9mm AR Barrel is precision-machined with a 1:10 twist rate. It is black Nitride coated inside and out for corrosion resistant. Whether you’re building yourself a new AR-15 or merely replacing your barrel, we have the barrel that will meet your needs. 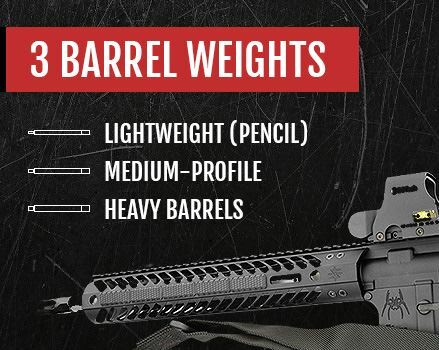 Give yourself an edge and weigh all the factors to decide which barrel is right for you. Wing Tactical is your AR-15 barrel dealer when you want to find the barrel that maximizes accuracy, durability and overall quality. And don’t forget about our same-day shipping for orders received prior to 1 PM Eastern Time or our 30-day hassle-free returns.